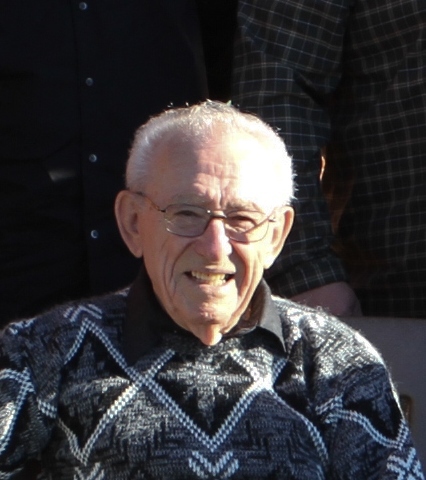 Louis J. Bondoni, age 93 passed away March 29, 2019 at his home surrounded by his loving family. He was born November 29, 1925 in Alliance, Ohio to Clement and Lodovica (Faccini) Bondoni. Louis was a WW II Veteran of the United States Navy, and been employed as a crane operator at Morgan Engineering Co. He also retired from Smith Machine, after 10 years of service. He was a member of the VFW and the Christopher Columbus. Louis was a strong family man, he had a sense of humor, loved mowing and feeding the birds, playing cards, very proud to be first generation to serve his country, an excellent work ethic. He is survived by his spouse Lillian (Erb) Bondoni whom he married April 4, 1953. Daughter; Caroline (Jim) Smith of Alliance. Son; Michael (Sue) Bondoni of Alliance. SISTERS; Mary Ritchie of Alliance, and Emma Eagan of Maximo. Grandchildren; Mike (Diana) Bondoni, Jason Smith, Becky (Zeke) Fernandez, Steven (Amber) Bondoni, Jennifer (Joe) Hoy, Chadd Bondoni, Jessica Pryor, and Douglas Pryor. Great Grandchildren; Kamryn Bondoni. Kaitlyn Bondoni, Dominic Hoy, Travis Hoy, Dalton Snyder, Lauren Snyder, Lexi Ferandez Catie Fernandez, Scarletta Rastetter, Azalea Pryor, Penelope Pryor, and Maddie Flores. Special Friends; George Priselac, Marsha Fuson, Larry Miller, Larry and Sherri Ritchie, and Rich Rinehart. Besides his parents he was preceded in death by sisters ;Stella Girardini, Josephine Kelly, and Tina Bondoni, and brothers; Leo and James Bondoni, and nephew Jimmy Bondoni. A special thank you to Southern Care Hospice and Canton VA; and Sebring Friends Church. In lieu of flowers donations may be made to Southern Care Hospice. Friends may call April 8, 2019 at the church from 5 to 7 p.m. and April 9, 2019 from 10 to 11 a.m.